SUMMARY: In this week's chart, we look at data from the MarketingSherpa 2012 Lead Generation Benchmark Report about the difficulty, effectiveness and usage of lead generation tactics. Be sure to share your own analysis of this chart in the MarketingSherpa LinkedIn Group for a chance to be published in a future blog post. Usage of a lead generation tactic can sometimes be driven by the hype surrounding it. Other marketers take an unbiased view of the tactic, and gauge its effectiveness versus its difficulty. Q. Please indicate the DEGREE OF DIFFICULTY (time, effort and expense required) for each of the lead generation tactics your organization is using. 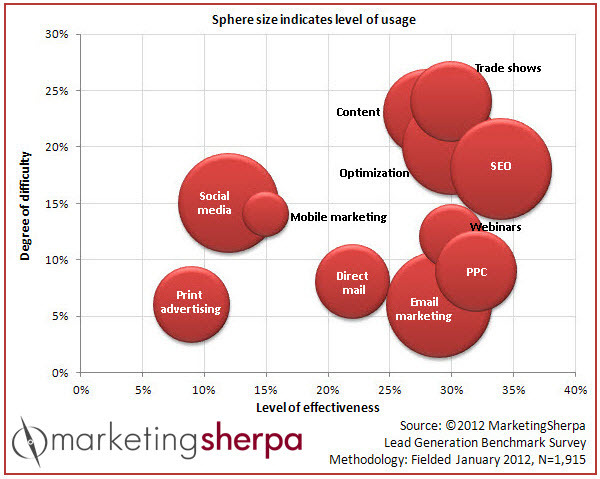 As you can see, search engine optimization was considered the most effective tactic, but also among the most difficult. However, it is not as difficult as another highly effective tactic (and important component of SEO) — content. Trade shows are considered more difficult than content. Although, even with the physical logistics issues surrounding trade shows along with the difficulty of sticking out on an often-crowded expo floor (not to mention the challenge of coming up with the coolest free swag), trade shows were rated as barely more difficult than content. On the flip side, email marketing was considered both among the most effective and least difficult tactics. Not surprisingly, it was also highly used. Mobile marketing, still an emerging tactic (although one that should go hand-in-virtual-glove with email) is among the least used tactics. Somewhat surprisingly, given its relative newness to most marketers, it was only considered about mid-range in difficulty. One of the biggest opportunities appears to be in webinars (another subset of the highly difficult content marketing). While marketers struggled somewhat with content, they did find webinars much easier. Combining that with their high degree of effectiveness and relatively low rate of usage (in other words, less competition for your webinars), they could be a tactic worth looking into for your lead generation planning if you do not already utilize them. Use this data, and the following questions, to help your marketing department evaluate its efforts. What challenges do you face with your SEO? Is it purely around the technical challenges of your website, or do you also struggle with the relationships necessary for link building or the content that must feed the beast? What challenges to you face with creating content? How do you plan to overcome them? Do you have a dedicated writer(s) or content creator(s) on your marketing team, do you outsource your content creation to a freelance writer(s) or an agency? Or is your marketing team responsible for generating its own content? Do you overlook relatively laggard techniques like print advertising simply because they don’t generate as much hype in the industry? While it has a low level of effectiveness, might its low level of difficulty and usage (competition for eyeballs) make it a worthwhile tactic to explore? Use the above questions internally with your own team to help improve your lead generation efforts, and also share your actionable advice and inspirational stories on the MarketingSherpa LinkedIn Group discussion about this chart for a chance to be featured in a future blog post. 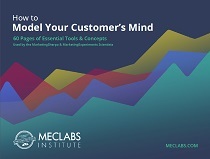 For more information about lead gen, read the free excerpt of the MarketingSherpa 2012 Lead Generation Benchmark Report.